Short run with resin and vac bits. Before helicopters became common-place, it was the autogiro that got all of the press as it was actually able to fly. The major difference in an autogiro and a helicopter is that while the spinning rotor provides lift, it requires a standard engine and propeller to get it off the ground. Basically, the spinning rotor blades replace the wing. Since they did not provide direct initial lift and motive power, these craft were unable to take off or land vertically, though they did have superb short field performance. Cierva was probably the major proponent of the type and was able to get a number of them sold to private persons. Various air forces also saw them as excellent battlefield reconnaissance vehicles where their STOL (Short Take Off and Landing) capabilities were most desirable. The RAF used them for radar calibration, an area where their slow speed abilities were quite helpful. They were also in use with the Spanish, Czech and the French forces. 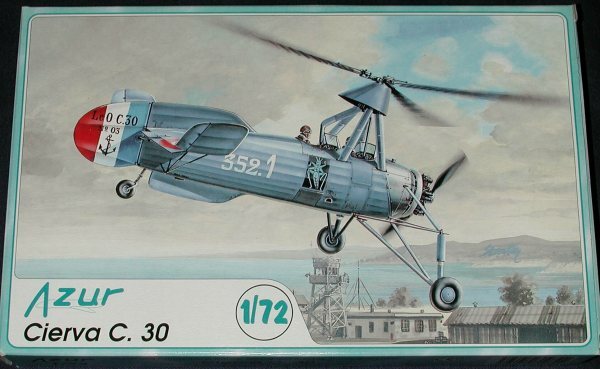 The French had a production agreement with Cierva and eventually built 64 of them, 56 alone for the French Navy. I've used the term 'typical Czech short run kit' to death, but that is just what this one is. A single sprue of injected plastic, a bag of resin bits, vacuformed canopies, and a very good decal sheet. Detail is engraved and very petite. This detail will disappear under the filler and sanding that you will undoubtedly be doing on this kit. I have yet to build a kit from the MPM family that did not need some work to get right and this one will probably not be any different. The resin parts are limited to the engine, exhaust, rotor head, and a small gizmo that sticks up out of the forward fuselage. There is some sidewall interior detail as well as a relatively complete interior, though no control sticks or rudder pedals are given on the simple flooring. This isn't unusual as the autogiro was controlled by a long control arm protruding back to the rear cockpit from the rotor head assembly. Probably the most demanding portion of the kit will be getting all the various struts that make up the landing gear properly aligned and glued together. I'd like to warn the builder that MPM plastic is a bit on the brittle side so you need to take special care when removing the strut material from the sprues to prevent breakage. Instruction sheets are well done and show the steps in three nicely penned drawings. There are markings for four different aircraft. First is a French Navy version from ES 3S2 in 1938-39. 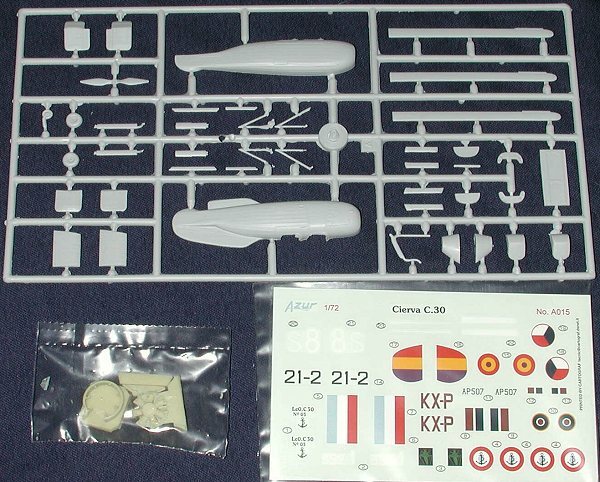 Like all Azur kits, the blue on the sheet is too light, and the French insignia and tail stripes need to be painted on or replaced if possible.. Next is an RAF version from an unknown unit. A Czech AF version from 1936 is next in overall green with a nice white fuselage stripe. Finally a Spanish AF version in overall silver. This is only the second time that an injected kit of the C.30 has been done. The previous kit was by Merlin models, whose line of short run kits has often been derided for their crudity. This one will be a bit easier to build, but is still not something that I'd give a beginner. Regardless, the final result will be an interesting addition to your collection, especially if rotary wing items are your passion.